Summertime brings vacations, trips to the park, pool and beach days and lots of exciting day trips! When you have little ones, there are so many things to remember to pack (diapers, sunscreen, back-up clothes, swimsuits, wipes) and often planning a healthy snack can be the last thing on your list. Get out of the rut of tossing a bag of random snacks in your purse or hoping you can source something healthy on the go. Summer snacking can be simple with a little pre-planning! Toss together our Happy Yogis (made with organic yogurt) or our Happy Creamies (made with organic coconut milk) with your favorite dried fruit, dark chocolate, popcorn, pretzels or nuts. Toss in our happy puffs for great snacks on the go! Take fruit to a new level by stringing fresh fruit onto straws for kid friendly kabobs. Try fun combinations of watermelon, berries, peaches and whatever you find at your local farmers’ market! 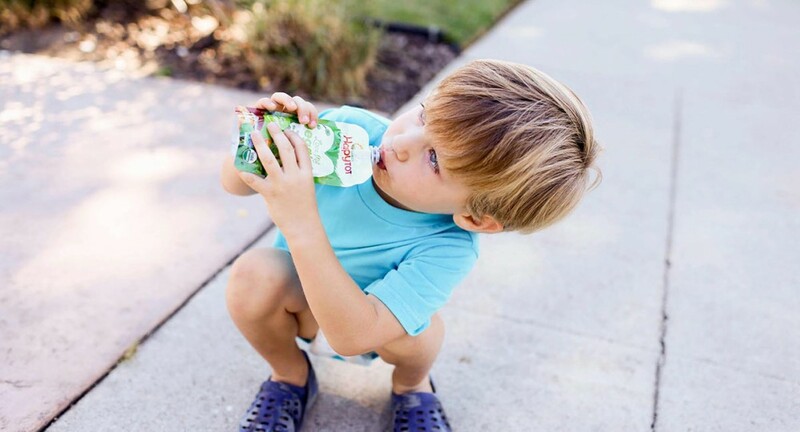 Room temperature or cold, the Happy Family line of pouches are for everyone! Happy mamas-to-be will love our Happy Mama pouch line, little ones love Clearly Crafted and your bigger kids will love Happy Tots and Happy Squeeze. All Happy Family pouches are made with organic fruits and vegetables, with some bonus superfoods! Freeze bananas, berries and watermelon for cool, yummy frozen treats without the sugar, fat and unnatural ingredients! Blend the fruit together for a smoothie! If you like great grab-and-go foods, freeze green and red grapes in individual bags for icy cold treats on the run. Pre-bake some mini muffins for great, yummy treats on the go! Try our Apple-Carrot Muffin recipe, for yummy organic goodness on the go! Launched on Mother’s Day 2006, Happy Family® is one of the first organic brands to offer a complete line of nutritious foods for babies’, toddlers’, and kids’ growing bodies. Constantly innovating, Happy Family has been a pioneer in the industry, adding probiotics and extra nutrition to many of its products—like chia, as well as plant-based DHA and choline for brain growth and eye health—whenever possible. Happy Family believes that every baby deserves to be a happy baby. Since its launch, the company has underwritten more than 1 million meals through Project Peanut Butter, a nonprofit that helps to feed starving children in Africa. For more information about Happy Family, connect on Facebook, Twitter, and visithappyfamilybrands.com.